Rana Mashhood Ahmed Khan son of Rana Abdul Rahim Khan was born on August 26, 1966 in Lahore. He belongs to a family having a long standing traditions/history of fighting and sacrificing for just cause. His grandfather, Rana Inayat Khan was a Member of Legislative Assembly, Kapurthala State. His father served as Secretary Lahore High Court Bar Association; as Vice Chairman, Punjab Bar Council and as Member, Pakistan Bar Council. Rana Mashhood Ahmed Khan obtained the degree of LL.B. in 1991. A practicing lawyer, who served as Secretary Lahore High Court Bar Association in the year 2001 and has the honour of being elected as the youngest Secretary in the history of Bar. He is also a Member of International Bar Association. He has also served as Chairman Legal Aid Committee (1993), Chairperson of ARD's Legal Committee and President of Lawyer Forum Punjab. 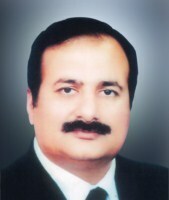 He remained Member, Provincial Assembly of the Punjab during 2002-07 and 2008-13 and served as Deputy Speaker Punjab Assembly during 2008-13. He has returned to the Punjab Assembly for the fourth consecutive term in general elections 2018. He has also functioned as Minister for School Education holding additional charge of Higher Education, Youth Affairs, Sports, Archaeology and Tourism from 2013 to 2018. He also held the portfolio of Law & Parliamentary Affairs during 20-06-2014 to 13-10-2014. 12-B, Aikman Road, GOR-I, Lahore. 199 Lane 10, Askari Housing Complex Walton, Gulberg-III, Lahore.